Music chair Jeffrey Carter and Webster Wind Ensemble students led singing of "Go, Go, Gorloks!" 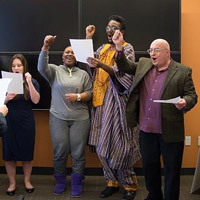 As part of Webster University’s Centennial celebration, the Centennial Planning Committee held a contest to compose a Fight Song for Webster Athletics. The contest was open to submissions from all faculty, staff, students and alumni from February to June 2015, with a $2,500 prize offered to the contest winner. Five qualified entries were submitted for competition, with a composition by Webster University alumnus Michael Hillstrom ‘94, “Go, Go, Gorloks!” selected as the winner. “While all of the entries were outstanding, this one particularly captured Webster’s mission, vision, and values, and of course speaks to Gorlok pride,” said Jeffrey Carter, chair of Webster’s Department of Music and Centennial sub-committee chair. “Enjoying music to deepen the bonds and affection people feel for their alma mater and their fellow classmates is a tradition that goes back centuries, and it’s a tradition that belongs at Webster." Hillstrom’s fight song joins the new alma mater created by Class of 2016 music student Christopher Poetz as additions to Webster’s repertoire during its centennial year. Webster alumnus Michael Hillstrom '94 won the Centennial contest to compose a fight song for Webster University Athletics. Also pictured are Julian Schuster, provost, senior vice president and chief operating officer; Scot Kilgallon, director of Athletics; Elizabeth (Beth) J. Stroble, president; Jeffrey Carter, chair of the Department of Music; Bob Chamberlin, director of Music Theory; and Centennial Steering Committee co-chairs Barbara O'Malley and Elizabeth Robb. An instructor of music theory and appreciation and an accomplished freelance pianist, guitarist and vocalist, Hillstrom is an alumnus of Webster University and Illinois State University, where he earned bachelor's and master's degrees in music composition, respectively. He has also schooled at the University of Minnesota, Marquette University, Rose Hulman Institute of Technology, and Moose Lake (Minnesota) High School. The contest-winning selection, "Go, Go, Gorloks!" isn't Hillstrom’s first composition for an institution of higher education. He also composed the graduation march for McHenry County College, where he is chair of the Department of Music and also writes for chamber orchestra, string quartet and other ensembles. Known for his dry sense of humor, Hillstrom also claims songwriting credits for novelty songs such as "What Shall I Do With Dorothy?" and the "Purple Polka Rap." 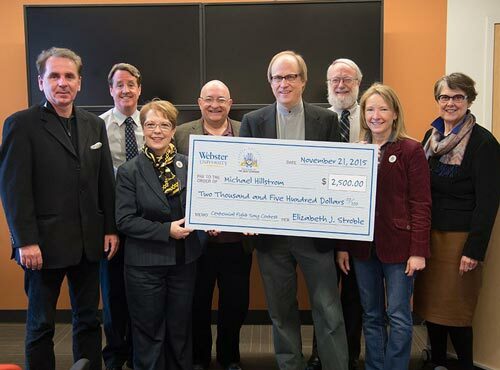 He was presented with his $2,500 award in a ceremony on Saturday, Nov. 21, in the Webster Groves Room located in Webster Hall on Webster University’s main campus in Webster Groves. Hillstrom, Carter, director of Music Theory Bob Chamberlin and student members of the Webster Wind Ensemble led attendees in singing the song. As Hillstrom's composition for the Gorloks declares, "Show that Gorlok pride!" See more photos from the presentation in this Facebook album.